Massive infrastructure projects and ample growth prospects have positioned ASEAN as a prime real estate investment destination globally, with properties in regional capitals typically offering higher rental yields and capital appreciation than assets in more developed areas. The region also leverages on an upsurge of interest across Asia as a whole, which saw total transactions of completed properties rising 19 percent year-on-year to US$61 billion in the first half of 2017 alone, according to Toronto-based real estate firm Colliers International. While Singapore, Kuala Lumpur, Bangkok and Jakarta have traditionally vied for the lion’s share of inbound investment, Vietnam has come into its own as a real estate market in recent years, with the introduction of friendlier foreign ownership laws in 2015 seen as a major catalyst. Amid hotspots such as the coastal metropolis of Da Nang and national capital Hanoi, Ho Chi Minh City has emerged as Vietnam’s most attractive investment draw, driven by rapid urbanisation, a planned mass rapid transit system, and expansion of its central business district, as well as an influx of regional developers. Unlike properties in regional capitals such as Kuala Lumpur, which have become increasingly skewed towards luxury launches as developers capitalise on higher profit margins in the segment, Ho Chi Minh City’s real estate landscape showcases a real estate market in near-perfect balance. Out of 201,862 condominium units launched in Ho Chi Minh City since 1999, 30 percent represented high-end offerings, with mid-range and affordable units accounting for 37 and 31 percent of launches respectively, according to real estate consultancy CBRE Vietnam. Luxury units accounted for just 2 percent of condominium launches over this period. In terms of new launches, the mid-range segment accounted for 64 percent of total new supply in 2017, pointing to a shift in the market towards end-user demand and essentially laying the foundation for sustainable future growth in the city’s residential market. This market focus also exerts downward pressure on selling prices, serving to keep Ho Chi Minh City properties affordable on a regional basis, offering value to investors from Hong Kong and China as prices in their respective home markets climb to historic heights. The average selling price for developers in Q4 2017 was US$1,564 per square meter (psm), with top-tier projects reported to fetch up to US$5,000 psm. This compares to prices of up to US$9,000 psm in Bangkok, while a waterfront house in Repulse Road Bay, Hong Kong fetched a record of over US$228,000 psm in the same year. 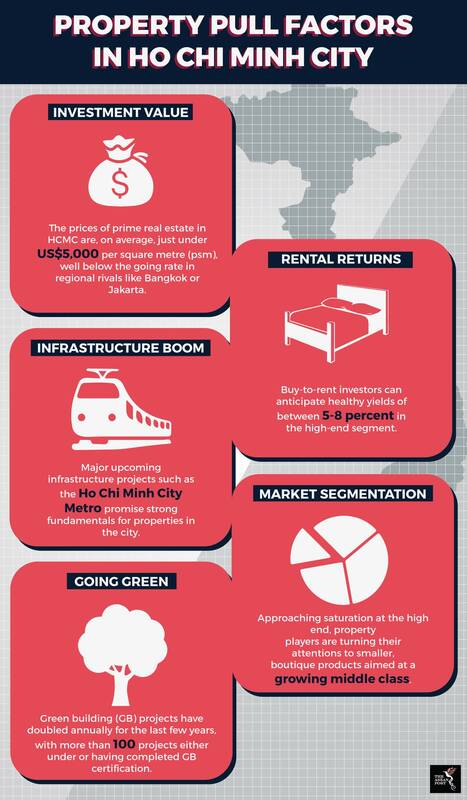 “The Ho Chi Minh City market has seen a strong recovery over the past four years, particularly in the residential sector, following a sustained downturn up to 2014 caused by the global financial crisis of 2009,” says CBRE Vietnam senior director Dung Thuy Duong. Residential growth in Ho Chi Minh City and Vietnam as a whole has been driven by rapid urbanisation, with 50 percent of the country’s projected population of 100 million slated to live in cities by 2020, according to the World Bank. This translates to an estimated 374,000 additional housing units needed annually to keep up with demand. The recent relaxation of foreign ownership guidelines, which amended existing regulations to be more conducive to international investment, has opened Vietnam up to a wider range of regional purchasers. Taking effect on 1 July 2015, the current framework allows the majority of foreigners granted a visa to purchase properties in the country, which had previously been restricted by conditions such as marriage to Vietnamese citizens, possession of specific skillsets and more. International buyers are now allowed to purchase landed properties in addition to apartments, which they can sub-let, trade, inherit and utilise as collateral as well, where they were limited to owner-occupation before. Foreigners can also own up to 30 percent of the units in an apartment building, 10 percent of the landed units in a residential complex, or 250 landed units in an administrative ward, up from the single apartment unit they were entitled to under the previous guidelines. While ownership for purchasers not married to Vietnamese citizens was formerly limited to 50-year terms, these can now be renewed on a leasehold basis. “Since these changes took place, there has been an increase in the number of international investors, with the majority of them coming from countries in Asia, primarily Taiwan, South Korea and Singapore, with interest from Hong Kong and China as well,” says Dung. “These purchasers are often individuals who have lived and worked in Ho Chi Minh City for extended periods and are well-versed in what its real estate market has to offer," added Dung. Other major growth drivers in Ho Chi Minh City include an upcoming eco-tourism hub in the coastal suburban district of Can Gio, known for its UNESCO Mangrove Biosphere Reserve Forest, Vam Sat Ecological Tourist Zone. Spanning 1,080 hectares, plans for the integrated development include more than 21,000 condominium units, as well as villa, office, retail and hospitality components. However, the prime catalyst in the city’s forward momentum is the Ho Chi Minh City Metro, comprising six planned underground metro routes with a total length of 107 kilometres, and three monorail/tramway routes totalling 37 kilometres, extending to neighbouring provinces. First proposed in 2001 to address mounting traffic congestion, the initiative is primarily funded by foreign capital sources, with international conglomerations also taking the lead in the engineering and construction of the project. It mirrors the ongoing Hanoi Metro in the national capital, slated to incorporate 229 stations along eight lines. Line 1 of the Ho Chi Minh City project, running 20 kilometres northeast from the Ben Thanh market hub to Suoi Tien with a reported total cost of US$2.5 billion to date, is partially financed by Japan’s Official Development Assistance programme, with the Tokyo-based Sumitomo Corporation and a joint venture vehicle between the Shimizu Corporation and Maeda Corporation as major contractors. Originally due for completion this year, its launch has been postponed to November 2020. Meanwhile, construction on Line 2, extending 11 kilometres southeast from Tham Luong to Ben Thanh, commenced in 2010, and was projected to end in 2020. That date has been pushed back to 2024, as estimated costs for the line has risen from US$1.4 billion to US$2.2 billion. It is financed by the German Bank for Reconstruction, the Asian Development Bank and the European Investment Bank. While Ho Chi Minh City is booming as an investment destination both domestically and regionally, its municipal authorities and city planners must ensure that development continues at a steady and sustainable pace, with full transparency. Aside from the Ho Chi Minh City Metro’s regrettable delays and funding issues, reports arose in April this year that the city’s land registration office had stopped issuing ownership certificates to international purchasers who bought homes after 10 December 2015. “There were a few pending ownership issues, mostly revolving around projects in specific areas, such as military zones or near government land. However, the government has compiled a list of projects which can be sold to international purchasers, and in my point of view, this is no longer a concern,” explained Dung. Though issues such as foreign ownership papers, delays in public transport development and capital shortages are being resolved, each has had a cooling effect on Ho Chi Minh City’s appeal to regional investors. Moving forward, such issues must be minimised, for while Vietnam’s fundamentals and pull factors remain compelling, it is entirely possible to play a strong hand very badly on the international stage resulting in a negative effect on the property sector in the country.